We have a Regimental Museum at Connaught House, which contains many interesting artefacts, including the original Loos Football, which has recently been re-conditioned. The Museum Curator, Alex Shooter, and his Assistants are available at all Regimental Association events and they can provide you with further information on the history of the Regiment. The Regimental Museum at Connaught House is open to visitors on the three days of the year when there are formal Association events – check the events page for the exact schedule of these dates. It has been another busy year for the Museum with continuing interest in the 100th anniversaries of the events of the Great War – 2018, of course, marks the centenary commemorations of the culmination of the London Irish Rifles’ fighting period on the Western Front and in the Middle East. Over the next few years, we now expect to see an increase in interest and research enquiries from family members of men who served with the London Irish Rifles during the Second World War. During the current year, we shall be marking the 75th anniversaries of the final victory in North Africa, the liberation of Sicily and the fighting advances along the Adriatic and Tyrrhenian coasts of mainland Italy – the 1st and 2nd Battalions taking a leading role in these campaigns. Annie Hall, the niece of the late Captain James Lillie-Costello OBE MC, met us at the Duke of York’s where she passed over her uncle’s full medal set in accordance with his wishes. Captain Costello was awarded the Military Cross for his leadership of E Company, 2 LIR on Hill 286 near Bou Arada during January 1943 and, following the end of the war, he would work for many years in a government role on the Gold Coast for which service he would be awarded the OBE. In August, Michael Hortin of BBC Lincoln shared with us the story of Rifleman Leonard Beechey, who died as a result of wounds suffered during the 47th (London) Division’s heroic defence of Bourlon Wood during November and December 1917. Leonard Beechey was one of five brothers who were killed during the First World War, a most remarkable and moving story and one which featured in a BBC radio series in November. Chris Bryant MP visited the museum in January to further his research into the army career of Colonel Jack Macnamara MP, the former Commanding Officer of the London Irish Rifles. Chris is currently writing a book about the men and women who were part of the “anti-appeasement” movement of the late 1930s in which Colonel Macnamara was a leading light. Of course, we particularly remember Jack Macnamara as one of the key drivers behind the London Irish Rifles’ adoption of the caubeen in 1937. In addition to these museum visits, former London Irish Rifleman Colin Murphy, who now lives in the USA, donated the medal sets of the Bennett brothers who both died while serving with the 1st Battalion during the Second World War. Albert Bennett was killed at Fosso Bottaceto in Sicily during July 1943 and his brother Ernest died in London in March 1945 as a direct result of wounds that he suffered in Italy. We would also like to thank Anthony Maher, our Northern Ireland Chairman, for passing the medals over to us. Further afield, as a by-product of research into the campaign journeys of the 38th (Irish) Brigade (which included the 2nd Battalion) during the Second World War, Assistant Curator, Richard O’Sullivan, was a major feature on the BBC’s 6 o’clock news in October. Richard had provided vital historical evidence to support the rededication in Catania of the final resting place of Irish Fusilier Edward Graham who was killed in Sicily in August 1943. It was a most moving occasion, which was attended by the twin sons of Edward Graham who had only been 15 days old when their father died. We continue to be most grateful to Association members for their ongoing close support to Museum activities and we especially appreciate the donations from current and former London Irish Riflemen and their families. A number of challenges remain clear in the years ahead including assuring the security of our large collection of historical artefacts as well as maintaining an ongoing ambition to move forward towards a full programme of digitisation of the most vital part of our archives – it is certain that both these matters, as well as currently unforeseen ones, will require substantial logistical and financial commitment and we are most grateful for the continuing enthusiastic support of the General Management Committee. The past year has been another busy one for the Regimental Museum with our small team of dedicated volunteers continuing to treasure and share the storied 157 year old history of the London Irish Rifles. During the year, we continued to add to our Regimental collection, the most notable procurement being a London Irish Rifles’ officer’s belt buckle that dates from 1860, just after the foundation of the Regiment – this is now the oldest dated artefact in the museum. Not surprisingly, there is continuing interest in the Loos Football and the ball spent two months during 2016 at an exhibition at London’s Guildhall and recently enjoyed an extended stay in New York as part of the 100 year commemoration of the United States of America’s entry into the First World War. We also continue to trace the centenary anniversaries of the 1st Battalion’s fighting period on the Western Front – 1917 saw them in the Ypres Salient and at Bourlon Wood – and track the 2ndBattalion’s journey from Salonika to the extreme desert and mountainous conditions of Palestine, which culminated in the 180th (London) Brigade’s entry into Jerusalem. Jenny Cuff, whose great-uncle, Lt George Whyte MC, served with the 2/18th Battalion in France, Greece and Egypt/Palestine before being killed at Kherbet Addaseh on 23rd December 1917. Jenny has recently privately published the set of letters that George had written home to his wife from the battlefields during 1916 and 1917. Paul Jackson, whose great uncle, 2nd Lieutenant Arthur Cunningham DCM, was one of three brothers from Clonmel who were killed during the First World War. As an NCO, Arthur had been awarded the Distinguished Conduct Medal for his actions at Loos before falling at High Wood on 15th September 1916. We were delighted that Paul could lay a wreath in France on behalf of the London Irish Rifles Association on the centenary of the first day of the battle. Author Michael Lynch, who shared the amazing story of the eight Beechey Brothers, who served with Allied Forces right across the world during the First World War. Five of the brothers would be killed, including Rifleman Leonard Beechey, who died of wounds suffered while fighting with the London Irish Rifles at Bourlon Wood in 1917. During the year, we also made fraternal visits to our museum colleagues at the Household Cavalry Museum in Windsor, and others further afield, including meetings with Lar Joye, the Military History Curator at the National Museum of Ireland in Dublin, and CQMS Gerry White at Collins Barracks in Cork. In addition we continue to foster close relationships with the Army Museums Ogilby Trust (AMOT) and the London Military Museums Network and these contacts are likely to become increasingly important over the coming years as we face the uncertainties affecting every military museum in the land. Last but not least, I would like to thank our experts on the Regiment’s History, Nigel Wilkinson, and Assistant Curators Peter Power-Hynes and Richard O’Sullivan, as well as giving special mention to the fund raising support of Tony Robinson. No doubt, the coming year is likely to be a challenging one for us all but I am hopeful that I shall be able to report in 2018 that we have enjoyed another successful year of remarkable discovery and shared remembrance. The past year has been extremely busy one for the Museum as we continued to host numerous visits from family members whose ancestors served with the London Irish Rifles during the Great War. A large number of original documents in the Museum, including press cuttings that date from the foundation of the Regiment in 1859, are an invaluable resource that allows us to turn up a plentiful supply of unpublished history. 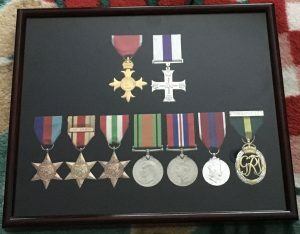 In addition, the Association’s website provides an excellent opportunity to explore previously untraceable family history and we have been able to uncover and share some fantastically moving and evocative connections with families of men who served with the London Irish Rifles over the past century and a half. Two activities during the year marked it as one of particular success for the Museum. The Regiment’s visit to France in September proved a most compelling one and prominent and in great demand was, of course, the Loos Football. It was present at the Regimental Dinner on the exact 100th anniversary of the start of the battle and was then on display the next morning at the very moving Remembrance Service at the Loos British Cemetery. As a coda to a fantastic weekend of commemorations, the football again became the centre of attention on our way home during our visit to Dud Corner CWGC Cemetery when we were able to share the story of Frank Edwards and his comrades with a number of other tour parties. All in all, it was a fantastic weekend. The other major achievement during the year was the publication of a Loos Commemorative Envelope that was issued by the Museum to mark the precise date of the 100th anniversary of this great historic battle for the London Irish Rifles. This project commenced in earnest when the Royal Mail issued its second annual tranche of Great War stamps in April and the “Artefact” selected to represent 1915 was the Loos Football. This was a beautifully photographed image in its own right, with the stamp being priced at the European Air Mail rate. After several months of coordinated support from the Royal Mail, we gained agreement to produce a limited edition issue of 250 hand stamped envelopes to be made available, initially to Association members as they journeyed to Loos. Two envelopes were also sent out to the Regimental Association President, Major General Purdon, and to the Honorary Colonel, General Sir Sebastian Roberts, and these were delivered to their homes on the morning of 25th September. The envelope comprised the previously issued £1.52 stamp along with an image of Lady Elizabeth Butler’s beautifully evocative painting of the ‘Footballers of Loos’. The pièce de résistance was a unique specially produced cancellation handstamp, which was dated 25th September 2015 – the post marking procedure had been overseen by staff at the Mount Pleasant Mail Centre. We would like to thank the Royal Mail, particularly Philip Parker and Natasha Ayivor, for their support in the successful production of this fantastic Regimental collectable. With the centenary anniversaries of the events of the Great War continuing to be commemorated – including the Regiment’s contribution to the battles at High Wood during September 2016 – the current year has seen a steady demand for the expert support of the team of Regimental Museum volunteers: namely Nigel Wilkinson, Richard O’Sullivan and myself. Association Members and their guests are, of course, welcome to visit the Museum on all Parade days at Connaught House during the year.